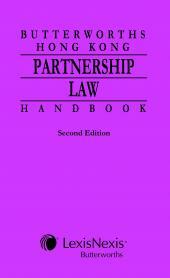 The Hong Kong Corporate Insolvency Manual started in 2000 as the course material for the corporate insolvency part of the then Hong Kong Society of Accountants’ Diploma in Insolvency course and has since over three editions developed into a leading resource for accounting and legal professionals in Hong Kong working in the field. The authors have maintained a practical approach, drawing upon illustrations from Hong Kong practice and providing checklists to assist professionals handling the day to day administration of insolvencies. 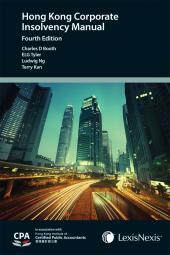 The Fourth Edition of the Manual is published by LexisNexis in association with the Hong Kong Institute of Certified Public Accountants. 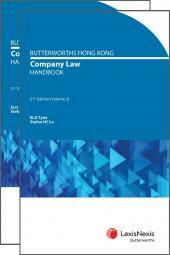 The Butterworths Hong Kong Company Law (Winding Up and Miscellaneous Provisions) Handbook details the remaining Parts from the "old Companies Ordinance" (Cap 32) that have not been repealed, and thus not included in the new Companies Ordinance rewrite. 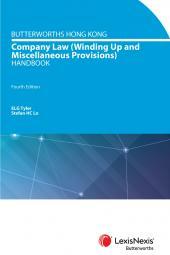 Provisions relating to prospectus, companies winding-up rules, insolvency of companies, disqualification of directors, receivership, restrictions on sale of shares and provisions relating to the Societies Ordinance are still in force under the now retitled Companies (Winding Up and Miscellaneous Provisions) Ordinance (Cap 32).